Turning your sport into a profession can be incredibly rewarding. To be able to give others their first experience of breathing underwater is a real job satisfaction! Since 1996, Happy Divers Marbella & IDC College has been creating the best instructors in the business. 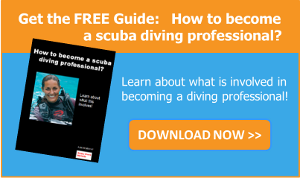 PADI Divemaster is the prerequisite certification for becoming a PADI Instructor. Become a PADI PRO and take your career anywhere. When was the last time you said, "I love my job! "? Go PRO and you'll be saying it all the time.